These pepper rings are a mix of banana pepper, jalapeno and one small poblano. Lacto fermented foods are a nutrient dense super food you can make at home. It seems that almost all traditional cultures have some form of fermented food. Whether it be fermented cod liver oil, natto, sauerkraut, or kimchi. 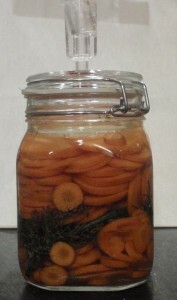 The process of lacto fermentation or pickling has been used to preserve food long before the process of canning. In fact, when properly fermented in anaerobic conditions and kept in cold storage, pickled food can last from one harvest season to the next. The basic method of pickling involves using salt to create a brine and allowing lactic acid producing bacteria to ferment the food. This process is similar to the process of brewing wine, mead and beer and is ideally performed under anaerobic conditions. The difference with lacto fermentation is that instead of alcohol and carbon dioxide, the bacteria produce lactic acid and carbon dioxide. The salt provides nutrients for the lactic acid bacteria. As the ferment proceeds, lactic acid is produced lowering the PH of the brine. This acidic brine helps preserve the food and prevent undesirable bacteria from growing. What makes lacto fermented foods so beneficial? First of all, the bacteria responsible for the fermentation are good for the human digestive track. This why they have been called probiotics. Secondly, by destroying the anti nutrients such as phytic acid that are in raw vegetables the fermentation process makes the nutrients contained in the vegetables more bio available. The ability to absorb nutrients from a piece of food is just as important as eating nutritious food. These cucumbers have just been placed in brine. A grape leaf helps hold the cukes under the brine. I have found that there is enough information online about lacto fermentation to get started. You will have to pick a vegetable and a fermentation vessel. The Pickl-It system reminds me of the car boys that are used for home brewing. In fact, the modified Fido jars are made in Italy, just like the glass car boys I purchased for brewing mead. 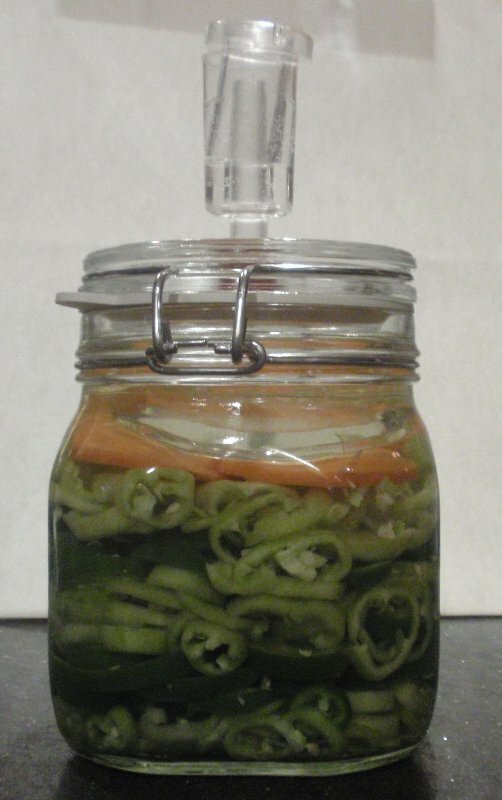 The Pickl-It jars also come in a range of sizes that allow me to ferment a large batch of pickles and a small jar of peppers at the same time. The next things to consider are the type of salt and water to use. The salt should be iodine free because iodine inhibits fermentation. The water should be chlorine free because chlorine kills the beneficial bacteria we are trying to cultivate during the ferment. Dilled carrots will be ready in a few days. 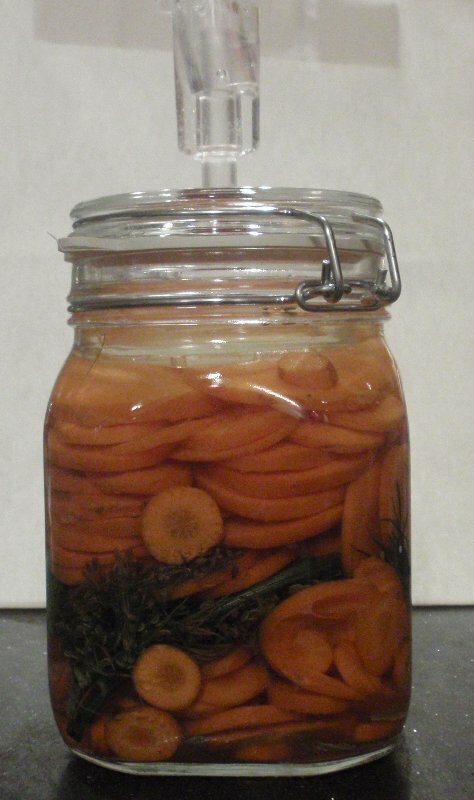 I got started pickling by making a batch of lacto fermented pickles according to this recipe. 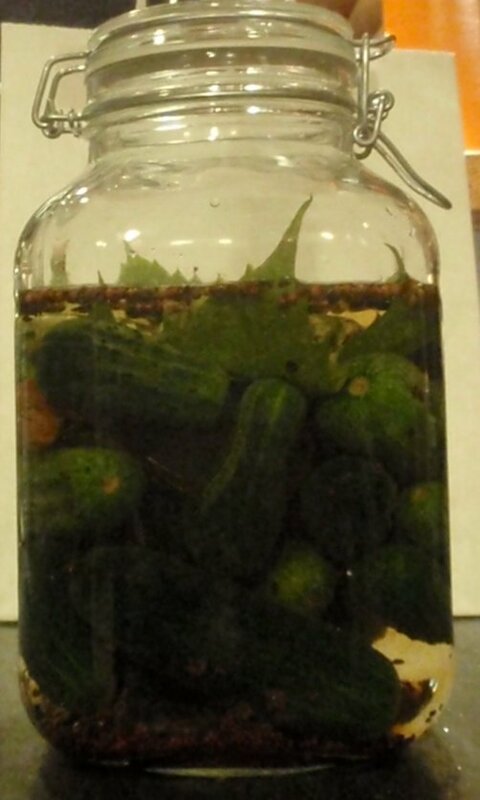 Some recipes state that making cucumbers into pickles produces surface mold. (See this recipe for example.) In my experience with two batches of pickles in the Pickl-It, I have seen no mold. In fact the pickles turned out so well, I ordered more Pickl-It jars and decided to try some different vegetable ferments. You may also want to consider this mandoline slicer from Amazon. It helps reduce prep time and produces uniform slices. I am wary of buying kitchen gadgets for fear that they will be used one time and then collect dust. I have used this slicer several times since buying it. It dices onions smaller than I would with a knife and so quickly that I don’t cry during the process. I also used it to slice the carrots and pickles in the pictures. Listed below are some recipes that I have tried, am currently fermenting or plan to make in the future. Jack Spirko talks about using lacto fermentation to preserve the bounty. If you listen carefully near the end he gives away the secret ingredient in his family chow chow. Bryan Davis is interviewed about the Ancients and Their Food. He discusses how lacto fermentation can heal the gut and gives a basic sauerkraut recipe. The video below from Cooking Traditional Foods demonstrates how to make sauerkraut in a Pickl It jar. I found it helpful to watch the process in action, especially to get an idea of just how much brine the cabbage should produce. Done properly, the salt draws a lot of water out of the cabbage. The Feed Me Like You Mean It resources page has lots of great links about lacto fermentation. Do you enjoy sauerkraut or other fermented foods?